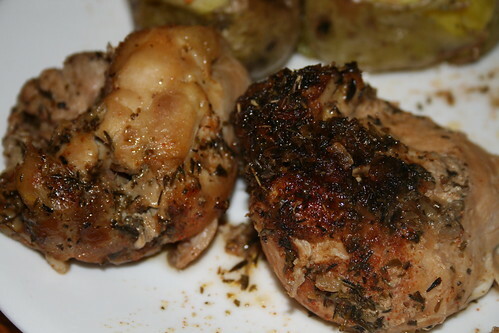 I made the rotisserie-style chicken in the crock pot for supper today. Instead of using a whole chicken, I used three boneless, skinless chicken breasts and six boneless, skinless chicken thighs. The seasoning is delicious. DH and DD both liked it, so we’ll be having this again. Wish you could smell this delicious chicken. The original recipe called for the following seasonings. My changes are in brackets. I placed the chicken in a crock pot sprayed with cooking spray, then sprinkled the spices over the top. The chicken cooked on high for four hours. Very easy! This entry was written by ~~Rhonda, posted on November 17, 2009 at 10:53 pm, filed under cooking and tagged chicken, cooking. Bookmark the permalink. Follow any comments here with the RSS feed for this post. Post a comment or leave a trackback: Trackback URL. Yum! Yum! I read about this yesterday on your blog and mentioned it to my Hubby. We plan on trying it on Sunday. I will follow your changes. MaryAnn, I used thawed. 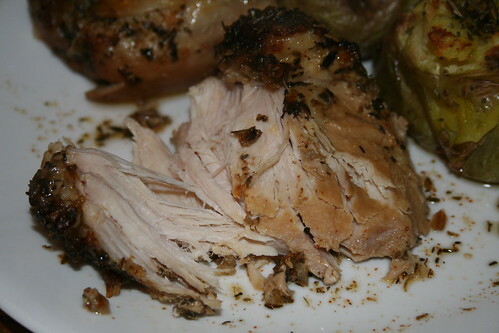 Here is a site that answers some questions about starting a crock pot recipe with frozen chicken. I just put my chicken in the crock pot! Thanks for the yummy idea! @ashkol…I hope you enjoyed it as much as we did! Thanks so much for leaving a comment! If I started it on low how many hours do you think it would take?because my cooks really fast..
Hilary, personally I’m a little leery of starting chicken on low. I usually cook it on high for an hour or two to get the temperature up, then turn it down to low for four or five more hours. Works well for us. Once it’s turned down to low, it can sit there for quite a while, as long as it has juice to sit in. Mine always does…except for the one time DH left the lid askew. 🙂 I used a whole (large) chicken this time and it was delicious, even after cooking all day. I think DD turned it to “warm” around 4:30. So…how long on low? Usual answer is eight hours. If your crock cooks faster than is usually called for, cut it back by an hour and see how it looks.